Many members of the public have poor mental health literacy. A Mental Health First Aid training course was developed in order to improve this. This paper describes the training course and reports an evaluation study looking at changes in knowledge, stigmatizing attitudes and help provided to others. Data are reported on the first 210 participants in public courses. Evaluation questionnaires were given at the beginning of courses, at the end and at 6 months follow-up. Data were analyzed using an intention-to-treat approach. The course improved participants' ability to recognize a mental disorder in a vignette, changed beliefs about treatment to be more like those of health professionals, decreased social distance from people with mental disorders, increased confidence in providing help to someone with a mental disorder, and increased the amount of help provided to others. Mental Health First Aid training appears to be an effective method of improving mental health literacy which can be widely applied. First aid courses are a well-established way of improving the public's handling of medical emergencies, but such courses typically ignore mental health issues. However, there are several reasons for extending this approach to mental disorders. Firstly, the prevalence of mental disorders is so high that virtually everyone in the community can be expected to either develop a mental disorder themselves or to have close contact with someone who does [1, 2]. Secondly, the public often have poor mental health literacy . They cannot recognize specific disorders or different types of psychological distress and they differ from mental health experts in their beliefs about the causes of mental disorders and the most effective treatments. Finally, there is a widespread stigma on mental disorders which causes an additional burden on sufferers . These factors lead to delays in recognition and help-seeking, hinder public acceptance of evidence-based mental health care, and cause people with mental disorders to be denied effective self-help and appropriate support from others in the community . To help overcome these problems, we have devised a first aid course, called Mental Health First Aid, focusing specifically on mental health issues. We did not believe it was possible to deal with these issues in adequate detail within the confines of an existing first aid course. The purpose of this paper is to describe the course and report data evaluating its effects. This nine hour course is usually delivered as three sessions of three hours each across three consecutive weeks. Each participant receives an accompanying course manual . The content covers helping people in mental health crises and / or in the early stages of mental health problems. The crisis situations covered include suicidal thoughts and behaviour, acute stress reaction, panic attacks and acute psychotic behaviour. The mental health problems discussed include depressive, anxiety and psychotic disorders. The co-morbidity with substance use disorders is also covered. Participants learn the symptoms of these disorders, possible risk factors, where and how to get help and evidenced-based effective help. 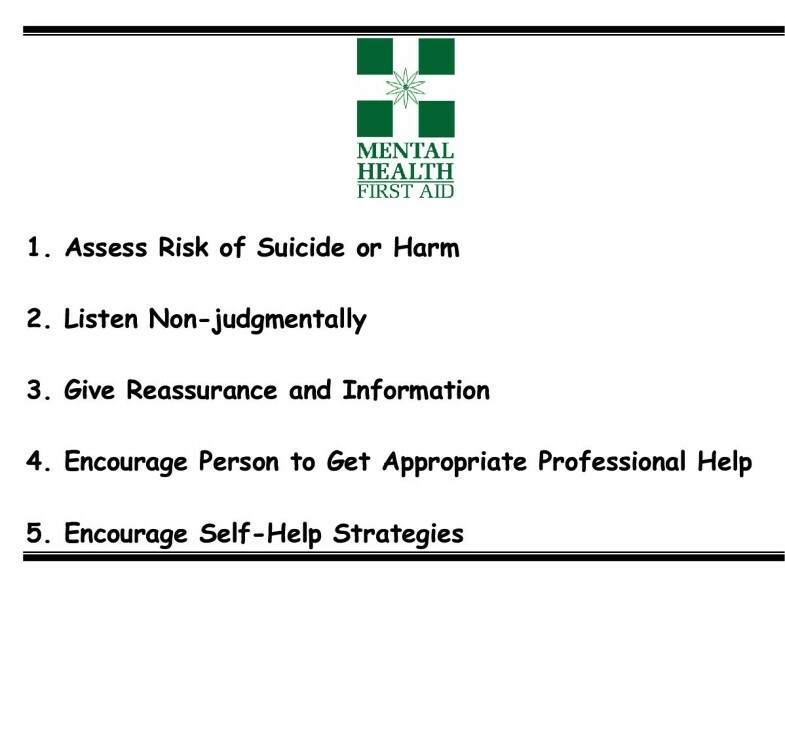 Five basic steps have been devised as an action plan for carrying out Mental Health First Aid (see Figure 1). This action plan is applied to each of the problem areas covered. The same instructor (BAK) taught all the courses. Mental Health First Aid courses have been conducted in two settings: with members of the public who respond individually to publicity and do courses in the evenings at the Centre for Mental Health Research, and with workplaces which request courses during working hours. The evaluation reported here was carried out with the first 210 participants in the public courses. These participants were given questionnaires to self-complete at the beginning of the first session of the course (pre-test), at the end of the last session (post-test) and were mailed a questionnaire 6 months after completing the course (follow-up). The questionnaires had an ID number but no name. The pre-test questionnaire began by asking about the sociodemographic characteristics of the participant and whether they had ever experienced a mental health problem themselves or whether someone in their family had. Participants were next asked "How confident do you feel in helping someone with a mental health problem?" (1. Not at all, 2. A little bit, 3. Moderately, 4. Quite a bit, 5. Extremely). This was followed by: "In the last 6 months have you had contact with anyone with a mental health problem?" (Yes/ No/ Don't know). If the participant said "yes", they were asked "How many people?" and "Have you offered any help" (1. Not at all, 2 A little, 3. Some, 4. A lot) and "What type of help?" (blank lines were provided for a description). The next section of the questionnaire was taken from the National Survey of Mental Health Literacy . Participants were presented with a vignette of a person who had either major depression ("Mary") or schizophrenia ("John"). Because it would have been too time consuming for participants to answer questions about both vignettes, they were randomly assigned to receive one or the other and were given this same vignette at each assessment. They were asked "From the information given, what, if anything is wrong with Mary/John" (open-ended question) and "Do you think Mary/John needs professional help?" (yes/ no). Then followed a list of people, treatments and actions that the person in the vignette might use and participants were asked to rate each of these as likely to be helpful, harmful or neither. The list was: a typical GP or family doctor; a chemist or pharmacist; a counselor; a social worker; telephone counseling services, e.g. Lifeline; a psychiatrist; a clinical psychologist; help from her/his close family; help from some close friends; a naturopath or a herbalist; the clergy, a minister or a priest; Mary/John tries to deal with her/his problem on her/his own; vitamins and minerals; St John's wort; pain relievers such as aspirin, codeine or panadol; antidepressants; antibiotics; sleeping pills; anti-psychotics; tranquillisers such as valium; becoming more physically active such as playing more sport, or doing a lot more walking or gardening; read about people with similar problems and how they have dealt with them; getting out and about more; courses on relaxation, stress management, meditation or yoga; cutting out alcohol altogether; counseling; cognitive-behavior therapy; psychotherapy; hypnosis; admission to the psychiatric ward of a hospital; electroconvulsive therapy (ECT); having an occasional alcoholic drink to relax; a special diet or avoiding certain foods. To score these items, scales were created showing the extent to which participants agreed with health professionals about which interventions would be useful. For depression, there is a professional consensus that GPs, psychiatrists, clinical psychologists, antidepressants, counseling and cognitive-behavior therapy are helpful, while for schizophrenia there is a professional consensus that GPs, psychiatrists, clinical psychologists, antipsychotics and admission to a ward are helpful . Thus, for the depression vignette participants received a score from 0 to 6 according to the number of these interventions endorsed as helpful, while for the schizophrenia vignette they scored from 0 to 5. To equalize the range of scores for the two vignettes, they were then converted to percentages. The questionnaire next assessed stigmatizing attitudes using a social distance scale . Social distance was measured by asking how willing the participant would be to: Move next door to Mary/John; Spend an evening socializing with Mary/John; Make friends with Mary/John; Have Mary/John start working closely with you on a job; Have Mary/John marry into your family. Each question was rated on the following scale: 1. Definitely willing, 2. Probably willing, 3. Probably unwilling, 4. Definitely unwilling. Responses were summed to give a score ranging from 5 to 20. Finally, the questionnaire asked "Have you ever had a problem similar to Mary's/John's?" and "Has anyone in your family or close circle of friend ever had a problem similar to Mary's/John's?". Post-test and follow-up questionnaires involved the same vignette that was randomly assigned at pre-test. However, the post-test questionnaire excluded the sociodemographic questions and questions related to personal or family mental health problems, confidence in providing help and actual help provided. The latter questions were excluded because it was believed that 6 months were required in order to see the effects of the course in daily life. The follow-up questionnaire was the same as the pre-test one except that the socio-demographic questions were excluded. The Chair of the Australian National University Human Research Ethics Committee advised that the evaluation work fell under the definition of quality assurance and therefore did not require formal approval by the Committee. The methods of evaluation conformed to the Helsinki Declaration. Scale scores were analyzed by analysis of variance in which time of measurement (pre, post, follow-up) was a repeated measures factor and type of vignette (depression or schizophrenia) was an independent groups factor. Dichotomous variables were analyzed using the McNemar test when two time points had to be compared (pre, follow-up) and Cochran's Q test when three time points had to be compared (pre, post, follow-up). The analysis was carried out according to intention-to-treat principles, so that all persons who completed a pre-test questionnaire were included, even if they subsequently dropped out. In such cases, the pre-test score was substituted for the missing value, so that no improvement was assumed. Of the 210 participants who began the course, 190 attended all three sessions, 14 attended two sessions and 6 attended one session. Some participants who completed the course chose not to return a questionnaire at post-test or follow-up. Consequently, questionnaires were available from all participants at pre-test, 168 at post-test and 166 at follow-up. Table 1 shows the sociodemographic characteristics of the participants. They were largely middle-aged women and tended to be well educated. Many were carers or health service providers. When the health service providers were asked to state their occupation, the biggest groups were "support worker/respite care/administration" (n = 29/65) and "nurse" (n = 15/65). Table 2 shows the reasons stated for doing the course, with reasons related to the workplace being the most common. Participants were asked at pretest and follow-up about whether they themselves had ever experienced a mental health problem or whether anyone in their family had. The percentage reporting these increased from 41.4% to 47.4% for self (P = .050, 2-tailed McNemar exact test) and from 73.4% to 79.0% for family (P = .052). Table 3 shows the percent who correctly recognized the disorder in the vignette, with 104 receiving the depression vignette and 106 the schizophrenia vignette. For the schizophrenia vignette, either "schizophrenia" or "psychosis" was considered correct. For those who received the depression vignette, performance was close to ceiling and no improvement could be found. However, there was improvement for those who received the schizophrenia vignette and also when both groups were combined. Table 4 shows the mean score on the scale measuring whether beliefs about treatment are concordant with those of health professionals. There was a change over occasions for both vignettes with beliefs becoming closer to those of professionals (significant linear trend in analysis of variance), but also a tendency for beliefs to revert somewhat at follow-up (as indicated by a significant quadratic trend). 1 Repeated measures analysis of variance. There were no significant interactions with type of vignette. Table 4 also shows the mean score on the social distance scale. As would be expected, those who received the schizophrenia vignette expressed greater social distance than those who received the depression vignette. However, social distance decreased over occasions for both groups (significant linear trend in analysis of variance), with some increase again at follow-up (significant quadratic trend). Table 5 shows data on confidence in providing help and actual help provided to others during the 6 months before the start of the course compared to the 6 months after the end of the course. Participants expressed increased confidence in providing help. Although they were not more likely to have contact with someone with a mental health problem, they reported that relatively more help was provided. There was also a non-significant trend towards providing multiple kinds of help, but surprisingly there was a decrease (non-significant) in the percent advising professional help. This evaluation has found several benefits from Mental Health First Aid training. The course improved the ability to recognize a mental disorder in a vignette, changed beliefs about treatment to be more like those of health professionals, decreased social distance (stigmatizing attitudes), increased confidence in providing help to someone with a mental health problem, and increased the amount of help provided to others. All these changes were found with a conservative intention-to-treat analysis. In this type of analysis, those who did not answer a questionnaire at post-test or follow-up were assumed to show no benefit from the course. On the negative side, participants were less likely to advise seeking professional help when they provided first aid to someone. Although this change failed to reach the conventional significance level (P = .052), it merits comment because it is contrary to the training given in the course to encourage the person with the mental health problem to seek professional help. A possible reason may be that some members of the public decided to participate in the course because they had had recent contact with a person having a mental health problem. Following the course, new contacts may have been fewer and hence there was less opportunity to recommend professional help. One could imagine, for example, the situation of a family carer who enrolled in the course to gain better helping skills, but had no contacts with additional people having mental health problems following the course. Consistent with this interpretation, participants reported having contact with significantly fewer people with mental health problems following the course. Nevertheless, the participants reported that the degree of help they provided was greater after the course. A potential criticism of Mental Health First Aid training for the public is that it will lead to the labelling of ordinary life problems as mental disorders. To check on the possibility of increased labelling, we asked participants about whether they themselves or members of their family had ever experienced a mental health problem. We found trends towards an increase, with P-values of .050 and .052, which are unlikely to be due to a true change in lifetime prevalence over a six month period, so must reflect increased labelling. However, the increases were small in magnitude and are appropriate given that many mental disorders are not recognized and professionally treated . There are several limitations of the present evaluation study. The major limitation is the lack of a control group. There is no reason to expect that knowledge, attitudes and behavior would improve over time without training. However, it is possible that repeated testing alone produced some change or that the participants were biased towards reporting improvements to please the researchers. To overcome this limitation, we are currently carrying out randomized controlled trials with wait-list control groups. Another limitation is that the participants were largely well-educated women. We do not know whether the findings can be generalized to the broader population. It is also not known whether the intervention increased access to care or produced other benefits to people with mental health problems, since the potential beneficiaries of Mental Health First Aid could not be directly assessed. As an approach to improving mental health literacy, Mental Health First Aid contrasts with broad-scale community education campaigns such as the Defeat Depression Campaign in the UK , the Depression Awareness Recognition and Treatment (DART) program in the USA  and the TIPS project in Norway . It aims to give more intensive education to a smaller number of interested people rather than less intensive education of the whole community. Of course, these contrasting approaches complement each other. However, a major problem with all mental health literacy campaigns is their sustainability. They require a large amount of government funding and generally run for only a few years. However, Mental Health First Aid has the advantage of being potentially sustainable in the long term. Just like conventional first aid courses, it can be run on a fee-for-service basis and requires no long-term government commitment. Mental Health First Aid was initially funded by a grant from the Australian Capital Territory government, but now that this has ended the course is being run as a fee-for-service program and demand continues, particularly from workplaces. Mental Health First Aid training appears to be effective in improving mental health literacy. It is an approach which could be widely applied in the same way as conventional first aid courses. The present evaluation of Mental Health First Aid has concerned the first 210 participants in the public courses. However, the course has been more popular than these numbers indicate, with approximately 1500 persons trained over an 18-month period out of a total adult population in the Australian Capital Territory (Canberra) of around 230,000 adults. Demand for the course shows no sign of abating and we believe it would be feasible to train 2% of the adult population. If extended a whole country, such a course could have a significant public health impact. The development of the Mental Health First Aid course was funded by a tender from ACT Health and Community Care. The course manual has been printed with a generous donation from Jennie Thomas in memory of her husband Philip Emlyn Thomas. Claire Kelly set up the data file for the evaluation. Betty A Kitchener developed and taught the Mental Health First Aid course, co-developed the evaluation questionnaire, collected the data and co-wrote the manuscript. Anthony F Jorm had input into the content of the Mental Health First Aid course, co-developed the evaluation questionnaire, analyzed the data and co-wrote the manuscript.